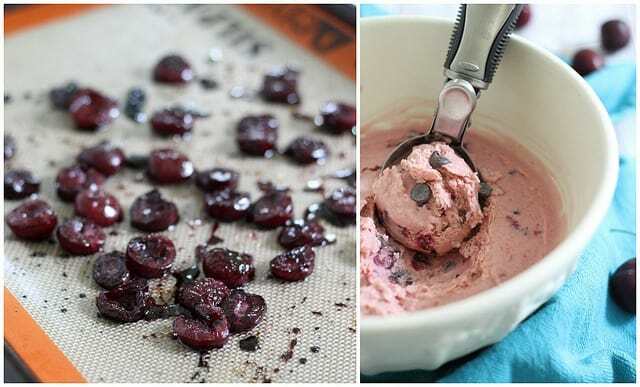 This roasted cherry chocolate chip frozen yogurt can be made without an ice cream maker! This summer has felt like a blur. There’s been exactly 2 weekends since the start of June that we’ve just chilled at home. There have been exactly zero nights we’ve used our chiminea on the porch and kicked back with a beer (or cider if your name is Ulysses). Instead, it’s been a stream of go-go-go, struggling to feel like you have any control over your life from both a work and personal standpoint and barely coming up for enough air to keep at it. And you know what makes it 10 trillion times worse, leaving you feeling completely on edge all.the.time? Last week I finally had enough. I turned off email push notifications on my phone. Turned off instagram “like” notifications. Told twitter mentions to shut the heck up. Deleted my Facebook “pages” app. I can’t even begin to explain how freeing it is to not have your phone buzzing at you constantly, waking up to see 25 emails in your inbox or obsessing over who has “liked” your stupid picture of food on instagram. These things take up so much mental space that you don’t even realize until you’re outside on your front porch, in bare feet, soaking up the sun, eating roasted cherry frozen yogurt that you made from scratch without any technological distractions watching your dog jump around like a maniac trying to eat a bee. 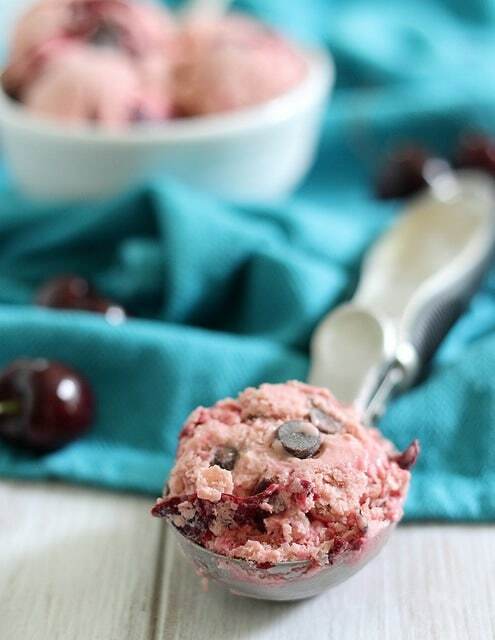 Just you, sweet honey roasted cherries, handful of chocolate chips and a crazy weimaraner that make you wonder why the heck you didn’t do this sooner. And then in the irony of all ironies, you write about it on your blog. Ha. 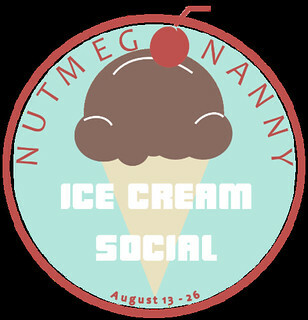 Hop on over to Brandy’s ice cream social party today for the full recipe and to check out all the other awesome ice cream posts during this 2 week event! I taught a new media class for the first time this summer–amazing how quickly social media can latch on and leech the life out of every moment, isn’t it? Good on you (I say as I type this comment…on your blog)! I couldn’t agree more with the social media. It can take up so much time! One of the reasons I got rid of Facebook. There’s actually a term for people who don’t want to get rid of social media. FOMO, or fear of missing out. It’s scary! And that picture looks delightful! FOMO! That’s so funny. I’ve caught myself checking my phone while eating dinner. What the heck. When did that become appropriate? I have been feeling just like you this summer. Overwhelmed and missing my own personal time. I love the idea of shutting things out though. I really need to do that. Sometimes I feel like a prisoner to my phone, which is just plain silly. That is why I love going to yoga every morning. 90 uninterrupted minutes for me. No phone, no IM, just silence. My breath. Maybe this weekend I will follow your lead and shut some stuff off and see how it feels. Thanks for the inspiration. And of course this frozen yogurt looks incredible!! Oooh the Mr would LOVE this! Seriously…. sometimes social media can be so overwhelming. Can’t believe summer is already over….some of our students are already back in classes. Can we back up a couple months? Roasted fruit making it’s way into fro-yo….love that! Mmmmmm…reminds me of Ben and Jerry’s Cherry Garcia flavor. Delicious! I had to go back and read that last part because I skimmed it and thought you were having issues with a bee lol. Both are equally funny but one is more scary. ;) You know… you could have just as easily left your phone in a cabinet and not looked at it. oh I take so many periodic breaks, especially lately. I’d much rather be outside in the summertime. It’s really so strange we care so much about likes and comments and tweets… its healthy to take a step back. OMG yum!! Roasted cherries?? I have GOT to try this!! I love “electronic free” days! And ones that involve frozen yogurt are even better! I don’t even have a smart phone (I know, welcome to the ’90s) So your tech-free day is my (really boring) life. Minus the frozen yogurt…that’s the part that would have made my day. I’m actually jealous of you not having a smart phone. Life during the flip phone era was way simpler. This summer has been crazy!! Sometimes you really just need to turn it all off! This frozen yogurt looks so good, love the color too. my blog is not even a tenth of how popular yours is, but i have been quite obsessed over it. so, it felt so good to go camping for days without wifi or even cellphone service. how liberating it was to not have to rely on technology at all. your ice cream looks so good and looks like real ice cream (not like my homemade ones that have frozen icicles). so i looked at the method over at your friend’s blog and was educated on the method of smashing it every half hour or so to make the results similar to that of real ice cream maker churned ice cream. brilliant! I don’t even have a phone buzzing at me all the time but it is SO freeing to just ignore everything for a while. I cannot wait to go camping for a couple nights and just completely unplug :) Thanks for reminding me that I meant to try roasting some cherries this year before cherry season is over. 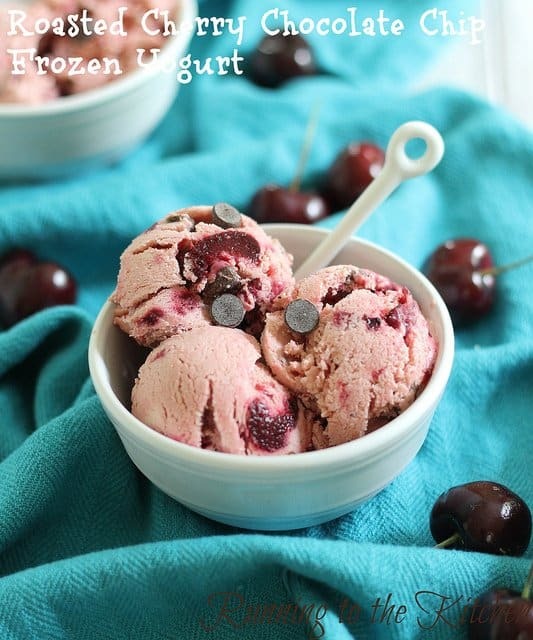 I have some in the fridge that are destined to be roasted :) Your frozen yogurt looks so delicious! I guess it was just turned on that way when I joined instagram b/c I didn’t even know there was an option NOT to have the likes show up until last week. Life changing, seriously. i hear you about the social media. my eyes open to notifications.. i need to switch those off and make these delicious and gorgeous frozen treat! I’ve only been away from the internet and social media a few times and I always feel twitchy when I can’t see what’s going on. Kind of scary! I could probably use a day like that. Probably. Good for you Gina !! !